So, yeah, I've been eating too much bacon since I gave up keeping kosher. Something like three times a week worth of bacon. When I wandered into the Thrifty Sifter's C-Town Grocery Store and discovered that they have an excellent fish selection (even grouper!) 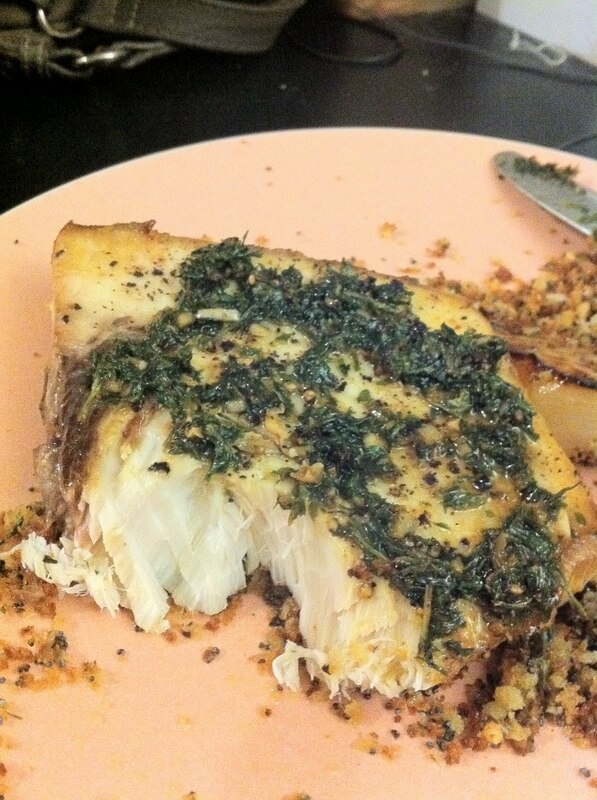 I decided to make an all-fish dinner. At the outset, I'm going to recommend leaving some of the seeds in as we could barely taste the spicy. Also, I know I made a no-no below with the garlic as it wasn't all the same size. I keep forgetting to bring my whet stone over to the Thrifty Sifter's house to sharpen up her cutlery. 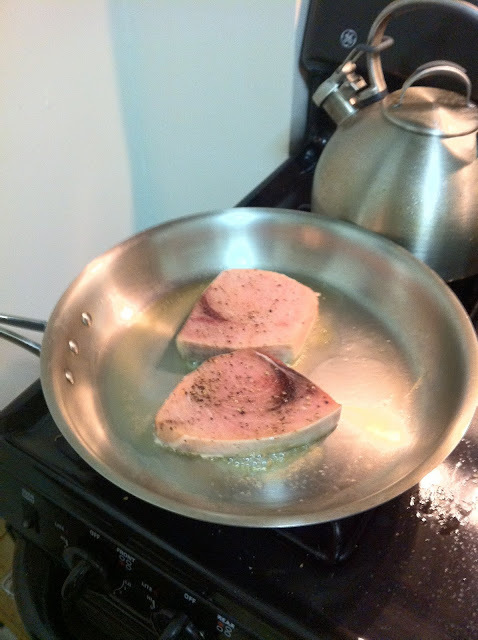 At any rate, pre-heat your pan, then add the oil. 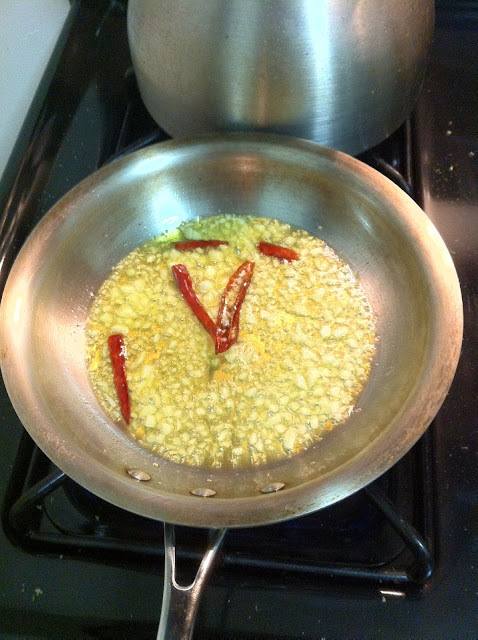 When it's shimmering, add the chilis and garlic. Cook until just before the garlic starts to turn brown. 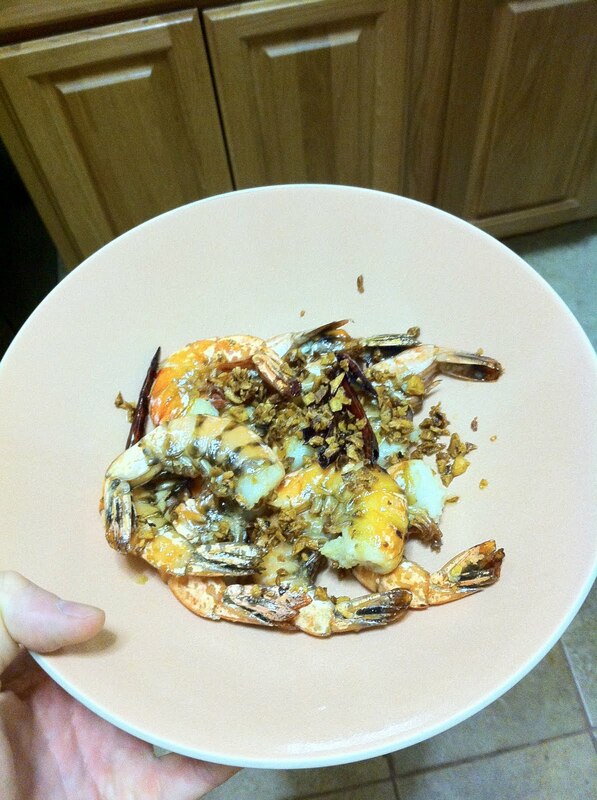 Add the shrimp or prawns. 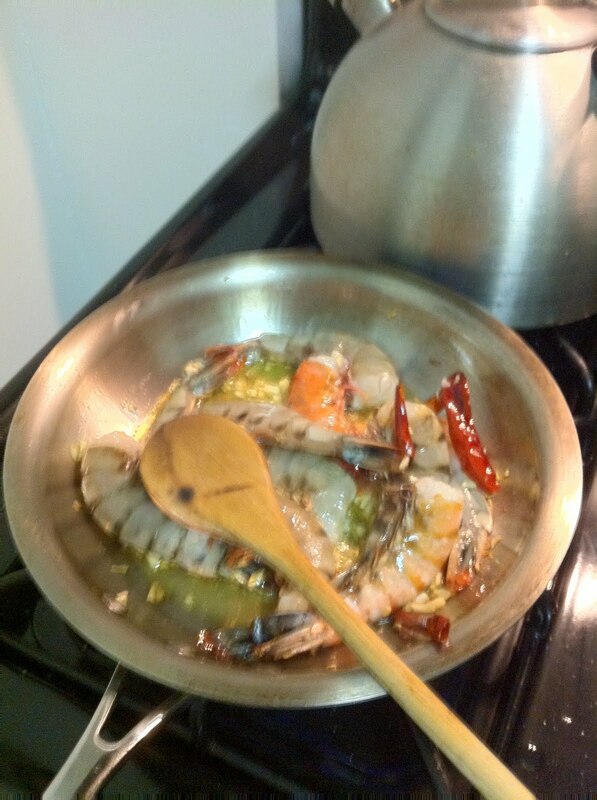 Stir-fry for 8 - 10 minutes. Serve and eat! 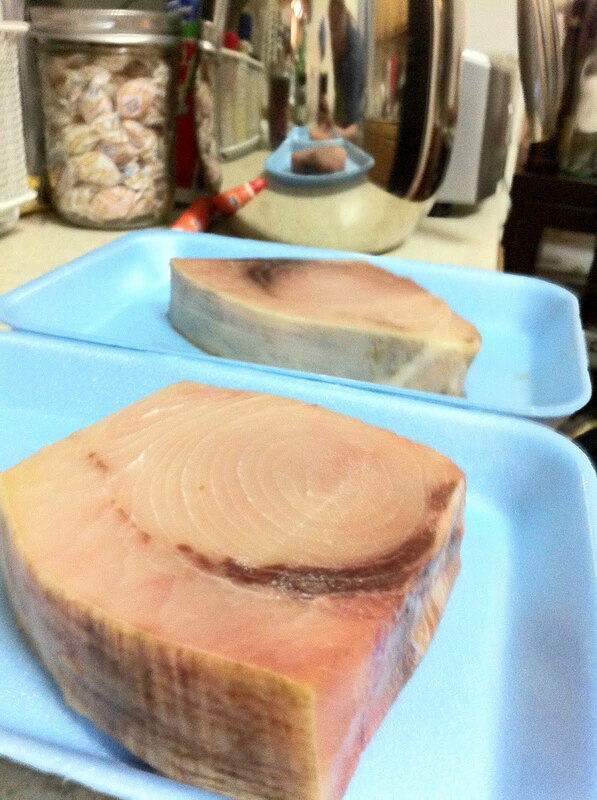 We ate this while I was cooking up the swordfish. This swordfish. I bought all the main ingredients without consulting a recipe, so we had to figure them out on the fly. Having worked in a fish restaurant for nearly five years, I can cook most any seafood without a recipe, but prefer to try new things. Here we hit up Epicurious for pan-roasted swordfish steaks with mixed peppercorn butter. The Thrifty Sifter made up that butter for me while I was making the shrimp. She's a great chef de partie. Cooking them up top of the stove in hot oil for three minutes. And after they come out of the oven, they are fantastic! Wouldn't change a thing about these. 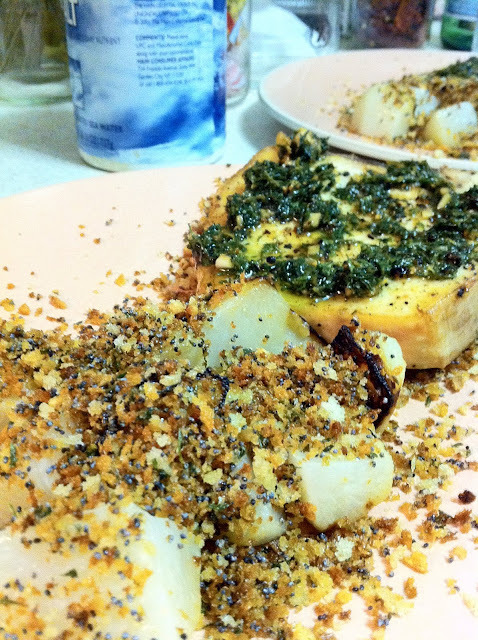 The side here is braised turnips with poppy seed bread crumbs. I would cut the lemon juice in half here as I found them to be too lemony. The Thrifty Sifter felt they were just right. Your soundtrack for this entry: Judas Priest - Breaking the Law.